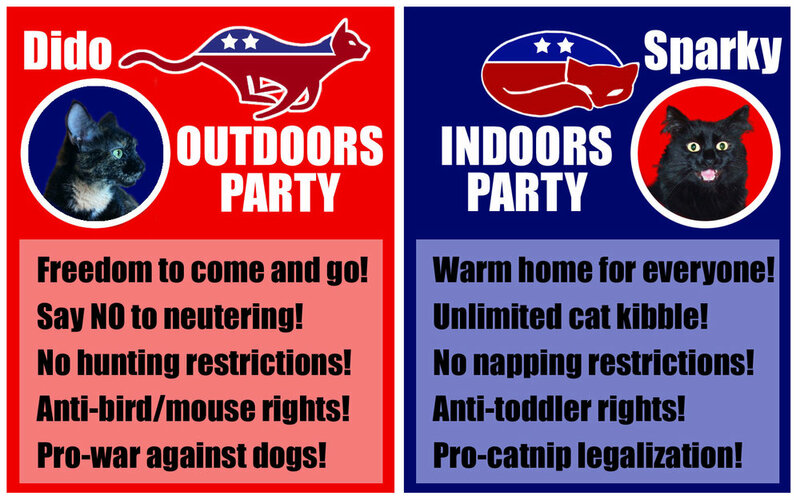 Although I don't agree with all their views, I love both kitties! Same thing with all my friends and family. I want to help all of them understand their opponents' point-of-view in a supportive and loving way. Knowledge is power! Years ago, my cousin Jack the Lawyer (he's now a judge) wrote an essay that had a profound impact on my life. In it he pointed out the cognitive dissonance implicit in the two party stances on the issue of abortion. That's when I first started noticing that issues on party platforms often don't make logical sense when taken together. 2. humans do not have the ethical right to take another life. After long reflection, I amended this a bit because for this argument to be valid the person in question must also categorically believe that human life begins at conception, rather than at the current limit of viability outside the womb, which as far as I know is 21 weeks and 5 days. Please note: I have ZERO interest in getting into a religious, ethical or scientific argument about abortion with anyone, anywhere, (although I can argue all day against state-sponsored euthanasia and the death penalty). I just agree with Jack that most folks aren’t being honest with themselves about what they really believe, or at the very least, haven't put much thought into it. 3. believe the overwhelming evidence that the benefits of vaccinations grossly outweigh the risks. One can argue the above premises here ad nauseum; logic and ethics are fascinating subjects because the premises are the toughest things to agree on. Human beings are emotional creatures; we all have biases based on our life experience and upbringing. I don’t think it is possible for us to function as purely logical creatures, and I wouldn’t want to live in a world where we did. I've given up trying to mediate between my left- and right-wing friends and family, as both sides are filled with so much rage they can't listen. I've tried saying, "Hey. When you have a free moment, in the shower or car, start looking for cognitive dissonance in the party platform you are opposed to. Political parties exist to win votes, not make logical sense. Figure out how various stances you find contemptible in the opposition don’t make sense when put together. I strongly suspect that exercise will expose some of your own biases. Which I fully support your right to have. It's just good practice to know thyself." The recent Planned Parenthood defunding news brought all this up to my own mind. I absolutely and totally understand at a logical and emotional level the viewpoints of BOTH major camps on this issue (although I think Planned Parenthood was doing its much-needed job). I certainly don’t know an answer that either side will be able to feel good about. I only know that until science fixes the abortion issue (by either discovering a way to safely remove and store developing fetuses or by figuring out how to grow a human from blastocyst to baby outside the womb), the topic will always be intrinsically tragic to everyone. Example: When my cousin Jack (then a law student) told me that only poor people work long hours, and successful professionals worked very few hours, but moments later complained that he didn't want to be a successful attorney because that would entail working ridiculously long hours, he was displaying cognitive dissonance.